Some days, I really, really wish Oscar Wilde had been around to see Twitter. I think he would have loved it. All those slick bon mots, those 140 character slices of wit, the pithy commentary on news and popular culture. Sounds like just his kind of medium. I think he would have enjoyed it for reasons beyond his sharp observational humour too. Wilde was among the first in the 1890s to fully popularize the idea of commodifying the self – of turning one’s own identity or appearance into a brand that could be sold or used to promote something. His personality (or rather, I should say, various personas) proved integral to audience reception of his plays. He was, in a sense, a performance himself. One of the things I’ve occasionally struggled with whilst studying English Literature is my desire to interject with comments like: “Oh, but that’s so relevant to social media today!” or, “wow, so basically this writer kick-started the idea of people as brands – he’d have adored taking selfies!” My desire to yank people and themes from the past into contemporary culture is fine for general conversation, but it’s not quite what’s expected in a tutorial. Yet the concept of offering yourself – your lifestyle, your aesthetic, your opinions, your image – up for public consumption is what the internet’s all about. Ok, no, that’s a gross generalisation. Let’s rephrase. It’s a phenomenon found in various corners online, with public platforms like Twitter, Instagram, Facebook and blogs allowing the individual to present a polished, publishable version of themselves. And it doesn’t just ‘allow’ it – but encourage. We’re expected to repackage certain aspects of our life online. Our meals. Our faces. Our response to TV shows or breaking news. For some this repackaging can be commercially successful. To many it’s just a bit of fun – albeit a fun that requires you to be continually updating another identity online. To a certain degree, for all of us who engage with social media, it does remain a bit of a performance. Like Wilde’s multifaceted presentation of himself and his works, what we put up online isn’t untruthful or non-genuine – but it is just a version, a single perception, a small window into an individual’s existence where we don’t know just what’s being concealed or revealed or fabricated or elaborated. And that’s fine. It would be weird to have an online representation that completely matched the messy, sprawling, complex personality of each person. More than that – it would be impossible. What fascinates me though, is how little we acknowledge this continual process of selection and construction. We may nod every now and then to the fact that we’re assembling ourselves online in every self-portrait snap in the mirror or snappy tweet. But we rarely extend that awareness to others. Although we can recognise which bits of our life we’re amplifying or highlighting, and which bits we’re leaving in the shadows, we tend to take what others put online as some kind of whole. So here I'm kind of performing a part, as I always do on this blog, my outfit, landscape and props suggesting a particular character, aesthetic or scene. 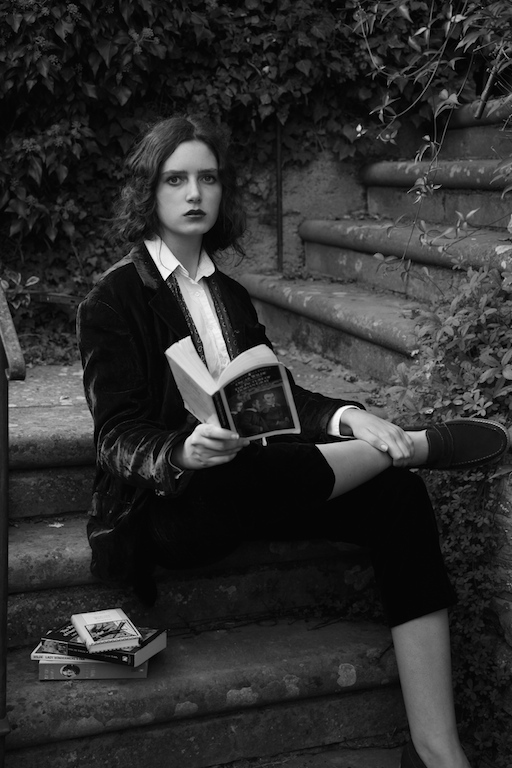 Obviously this is something of a homage to the man himself, my emulation of Wilde achieved with plenty of second hand velvet, a shirt and some loafers from a charity shop, vintage accessories, a stack of books and heaps of kirby grips to tuck and pin my hair up in place. (PS Thus what might look like a hair cut is not. Just another assembled element of visual image). Great pictures as usual. I would love to see an Oscar Wilde / Stephen Fry face off, or twitter off. He is almost a mirror of Wilde. That's such an interesting thought! Makes me wonder what a lot of historical figures would think of today's culture. A few weeks ago I was watching an episode of Bewitched and Samantha's Aunt accidentally summoned Benjamin Franklin and he was so intrigued by how the world had changed, ha ha. Ah! I love how our writing and thoughts parallel each other! I just finished a biography of John Lennon last night, and I've been thinking the exact same thing, only I think I would have let the thought escape unexamined, which I now see would have been a shame. Lennon loved turning his life into art and vice versa, especially once he got together with Yoko. As I was reading, I was thinking how much he would have loved Instagram, loved the instant access to his audience. He loved sharing his personal life as a way of influencing people long before the social media craze, and his way of using it definitely elevates the concept in a similar way that you do. The book is only 160 pp., and it's called The Cynical Idealist; it's more a spiritual biography, written by a guy who wanted to preserve John Lennon's legacy for the next generation who are starting to forget what he represented-- love and peace and art much more than just being a millionaire rockstar. It's really fun to read with your laptop beside you, listening to the songs as you read, and occasionally unfortunately sobbing as I did when I got to "Beautiful Boy", his lullaby for Sean which contains a heart-rending line, something like "I can't wait to see you come of age." These portraits are extraordinary by the way. You truly capture Oscar Wilde's insouciance and even his look of secret amusement, as if he's just on the verge of composing a bon mot or thinking something wicked. Unfortunately, I think there is still so much antipathy towards the concept of the artist creating himself-- Wilde felt it, Lennon did. I just posted a picture on Insta that got reposted by Housing Works and then trolled, and it was devastating. That's the downside I suppose of instant access to your audience. Well, this lovely post helped remind me of the good side of all that! If you take the afternoon to read the book and hang with John's music, let me know if you like it! I'm going to try to post Friday about my newest flash fiction story, which has a nod to thrift store fashion in it and should tie neatly with the research I've been doing on sustainability and the fashion industry. what a wonderful look! 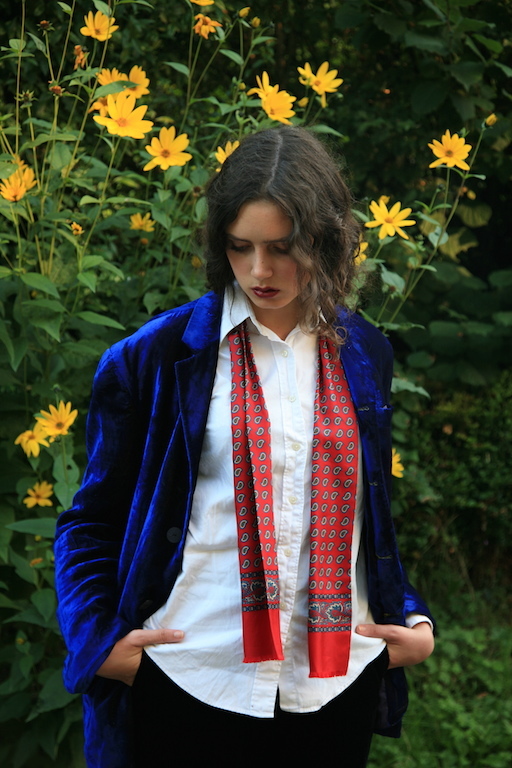 love the velvet blazer...and there's a dainty element in it that so reminds me of Oscar. and here I'm to continue with my comment...I'm not sure we take what is on social media or internet as truth...or what other present as true presentation of their self. Isn't every celebrity accused of photo-shopping their image (in literal or metaphoric sense) sooner or later? Social media can certainly be an interesting tool to study the human psychology...in some ways it has changed our lives, but in others it has shown something that was always there- perhaps a desire to communicate? I think that inside we're (almost) always full of doubts, about ourselves and about others...and sometimes we need to question everything. This is an interesting subject that I often ponder about, not just toward historical figures or authors... But, even my grandparents who were born long before The Great Depression, conceiving the concept of social media and touchscreen tech devices blew their minds. 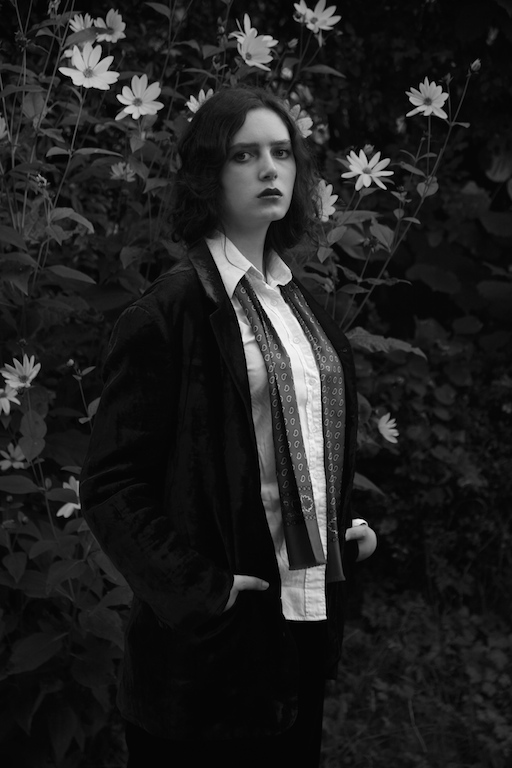 I love your character interpretation, the velvet blazer, and androgynous styling looks wonderful. I absolutely love the timeless quality of your first photo. But the blue velvet, I lose myself in there. I automatically have thought that writers from the past would say, ah, bah, humbug, about new technology. After reading this methinks I am WRONG! Oscar Wilde was a man of dazzling wit - wonderful homage to him. SO loved your thoughts on how he would have enjoyed twitter - and I think you're absolutely right! I really need to read more of his work; I've only read The Nightingale and the Rose (and that was 4 years ago!) And YES, yes, yes and yes to everything you said about social media and the way we present ourselves, it's so true and something I often think about. Really brilliant post and those pictures are stunning, especially the black and whites (and ESPECIALLY that first one!). This is one of the thousand reasons why I love to read your blog. Apart from having an exceptionally beautiful and expressive face, you're able to mix up a customized conception of fashion with a wittiness that would have made great authors clap their hands. The idea of re-inventing ourselves for social purposes, or better, on social grounds, is something that has always tickled my fancy. It is such a contemporary cause for reflection, isn't it? But my question here is: why do some people are actually capable of making up very good characters of themselves, while others just look too hideous to be considered another version of oneself? That is such a perceptive observation regarding Oscar Wilde and social media! I think you are spot on! Come to think of it, his fellow aesthete, Baudelaire, might have really enjoyed having Twitter, Instagram and Facebook as avenues too. My husband and I were just discussing Oscar Wilde yesterday. It takes quite a bit of talent and layered nuance in order to critique society while having them laugh alongside you! I adore Oscar Wilde and do wish he was our contemporary. is sort of along the lines of your train of thought, crafting ones' existence as a work of art. Great piece and I love how you crafted yourself in Oscar Wilde's image. Your blue velvet jumps off the screen. I love these thoughts of you!